"Little Embarcadero" is about to get a pedestrian makeover. The San Francisco Examiner reports the area the Embarcadero turns into west of Powell Street, is gearing up for a pedestrian makeover that will first and foremost get rid of all the fencing blocking off Pier 43½. But the pier, which has been off limits since 2008 because it was getting weak in its old age, will actually be largely demolished — leaving a historic bell display at the tip of the pier intact and a 12-foot pedestrian walkway up to the bell. 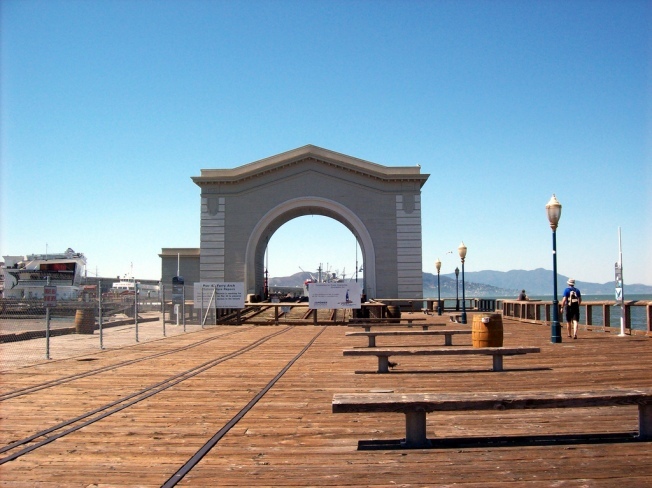 The old Pier 43 ferry arch stays, the big expanse of concrete goes. Little Embarcadero should then get an Embarcadero-style promenade with mobile vendors and some seating. The proposal goes before the Bay Conservation and Development Commission Tuesday evening.